There is a relative paucity of data in the literature regarding the prevalence of meningiomas and their detection in the clinical setting of neuroendocrine tumors (NETs). The primary aim of this study was to study incidentally detected meningiomas (on 68Ga-DOTATATE/18F fluorodeoxyglucose positron-emission tomography/computed tomography [18F-FDG PET/CT]) in metastatic NET patients referred for peptide receptor radionuclide therapy (PRRT). The secondary aims of this study were to evaluate the response rate of these incidentally detected meningiomas following PRRT and determine progression-free survival (PFS) in this group of patients. This was a retrospective analysis of 500 metastatic/advanced NET patients who had undergone68Ga-DOTATATE PET/CT and18F-FDG PET/CT before PRRT workup. The case records were searched to identify cases of hitherto unknown meningiomas detected on PET images; subsequently, these patients underwent brain magnetic resonance imaging (MRI) for confirmation of diagnosis. Following177Lu-DOTATATE PRRT, posttreatment functional and structural imaging response evaluation of the meningiomas were undertaken by 68Ga-DOTATATE PET/CT, MRI, or CT brain, respectively, along with clinical neurological evaluation. The patients were designated as responders and nonresponders based on predefined response assessment criteria. The PFS of these incidentally detected meningiomas following PRRT was estimated using the Kaplan–Meier product-limit method. Twelve NET patients were retrospectively identified with abnormal focal brain uptake on 68Ga-DOTATATE PET/CT. Of these, meningiomas were finally diagnosed on brain MRI examination in six patients (M: F =3:3; age range: 30–66 years; and mean age: 45 years), with a prevalence of 1.2%. Standardized uptake value (SUVmax) of meningiomas on 68Ga-DOTATATE and18F-FDG PET/CT ranged from 7.0 to 22.0 (average 17.0) and 10.19–13.70 (mean: 12.10), respectively, and lesion-to-normal brain parenchyma SUVmax ratio ranged from 140 to 400 (mean: 340) and 1.02–1.07 (mean: 1.04), respectively. Of six patients with incidentally detected meningiomas, one patient died within 1 month and five patients received177Lu-DOTATATE PRRT, the number of cycles ranging from two to six (average: 4) and cumulative therapeutic dose ranging from 13.28 to 29.97GBq (average dose: 19.86GBq). Follow-up in these patients ranged from 8 to 36 months (mean: 19.4 months) after the first dose of PRRT. Complete disappearance of neurological symptoms was found in two of five patients (40%), partial response in one of five (20%), and worsening of symptoms in two of five patients (40%). The overall “responder” and “nonresponder” of the meningiomas after PRRT were three patients (60%) and two patients (40%), respectively. Two patients (40%) died of advanced NET at the time of analysis of these data. The observed mean PFS of the meningioma lesions following PRRT was 26.25 months (95% confidence interval, 16.65–35.84 months).No major hematological and renal toxicity were documented in any of these patients. To conclude, 68Ga-DOTATATE PET/CT imaging is an effective technique for the incidental identification of meningioma in NET patients. Considering the limited therapeutic options in the palliative setting of advanced or metastatic NET patients and morbidity associated with the therapeutic procedures, PRRT could be a promising targeted therapeutic approach for such cases of incidentally detected meningiomas, which is also helpful in stabilizing the disease process without any significant toxicity. Meningiomas are the most common primary brain tumor and account for 35% of primary intracranial tumors with a yearly incidence of approximately 7.44/100,000. They are more common in women, with a 2: 1 female-to-male ratio of cases. Meningiomas arise from the meningothelial cells of the arachnoid membranes, which are attached to the inner layer of the dura mater. These are commonly slow-growing benign lesions (the World Health Organization I [WHO I], 80%–90%). The atypical (WHO II, 5%–15%) or malignant meningiomas (WHO III, 1%–3%) are also reported in the literature. Most of the meningiomas are asymptomatic clinically, but sometimes they can be associated with seizures, headaches, vision loss, or focal neurological deficits depending on their location. The 5-year survival rate is 70% for benign lesions and 55% for malignant meningiomas, dependent on age, tumor size, and treatment administered. Therefore, the management and treatment strategies are important in these patients, which are based on tumor grade, size, location, and comorbidity associated with the tumor. Surgery is the primary mode of treatment for meningiomas. Attempts to resect these tumors involving critical neural or vascular structures does carry the risk of devastating vascular injury or disabling cranial neuropathies., Recurrences are common ranging between 2% (benign meningiomas) and 78% (malignant meningiomas) reported in patients with apparently complete surgical resection;, Furthermore, complete resection is impossible in several cases due to the involvement of the critical structures in brain. Other treatment options in these patients include external-beam radiation therapy, stereotactic radiosurgery (SRS), boron neutron capture therapy, chemotherapy, immunomodulation therapy, somatostatin therapy, and targeted molecular therapy. Neuroendocrine tumors (NETs) are a heterogeneous group of tumors that arises from cells of neuroendocrine origin in many different organs, but more frequently from the gastrointestinal tract and the lungs. Less common involvement of NET includes thymus, adrenal medulla, pituitary, parathyroid, and thyroid glands. NET incidence and prevalence have been steadily increasing over the past three decades, likely as a result of trends in imaging and improvement in diagnosis. A small cyclic neuropeptide is found in neurons and endocrine cells, known as somatostatin, which has a high density in the peripheral neurons, endocrine pancreas, and gastrointestinal tract. The most NETs express somatostatin receptors (SSTRs), which can be used as targets for radionuclide imaging and therapy, also known as the theranostic approach.,,,,,,,,, In the last two decades, the theranostic approach with peptide receptor radionuclide therapy (PRRT) has gained substantial popularity in the treatment of metastatic/advanced NETs and other SSTR-positive tumors. This was proven by the randomized, Phase III NETTER-1 trial, which concluded that PRRT resulted in markedly longer progression-free survival (PFS) and a significantly higher response rate than high-dose octreotide long-acting repeatable (LAR) among patients in advanced midgut NET patients with high-level evidence of safety. Meningiomas can express a variety of receptors such as progesterone, androgens, growth factor, prolactin, dopamine, and SSTR subtype 2 (SSTR2)., Abundant expression of SSTR2 is a characteristic of NETs; similarly, meningiomas express relatively high levels of SSTR2, thus making them ideal targets for functional imaging for early diagnosis, recurrence detection, and also for potential radionuclide therapy with PRRT. In the literature, there has been limited data available on the prevalence of incidental meningiomas, especially in the patient population of NETs. Due to the high diagnosis rate of68 Ga-labelled SSTR analog based positron-emission tomography (PET)/computed tomography (CT) to detect meningiomas, we sought to determine the rate of probable meningiomas, in the setting of metastatic/advanced NET patients undergoing molecular imaging before PRRT therapy in a tertiary care NET center. The present study also aimed to determine the response rate of incidentally detected meningiomas in cases who underwent PRRT, by clinical symptomatology and objective response using molecular and structural imaging and also determine PFS related to meningioma lesions in this group of patients. We retrospectively reviewed the patient records and also the molecular and structural imaging data of all these 500 patients with metastatic/advanced NET, who had undergone PRRT with177 Lu-DOTA-octreotate therapy at our institute between January 2012 and June 2017. Of these, 12 NET patients were found to have suspicious areas of high-grade tracer uptake in the brain on68 Ga-DOTATATE PET/CT scan. In this retrospective analysis, we found that these 12 NET patients subsequently underwent MRI brain examination to characterize the high tracer uptake foci on the68 Ga-DOTATATE scan. Of these, meningiomas were diagnosed in six patients based on brain MRI examination, two patients had been diagnosed to have pituitary adenoma with rest of brain parenchyma was normal on MRI scan, four patients had metastatic paraganglioma with skull base soft-tissue lesions and normal brain parenchyma was found on MRI study [Figure 1]. All the aforementioned NET patients were referred for PRRT workup at our institute and were evaluated with dual-tracer approach incorporating68 Ga-DOTATATE PET/CT scan and18 F fluorodeoxyglucose PET/CT (18 F-FDG PET/CT) as part of the pretreatment evaluation and the patients were administered PRRT with177 Lu-DOTATATE if the tumor lesions were found to be positive for SSTRs in the68 Ga-DOTATATE PET/CT (Krenning score ≥ 3). The patients were imaged on a state-of-the-art time-of-flight PET/CT system (Gemini TF 16, USA) following standard protocol comprising an injection of 100–200 MBq of68 Ga-DOTATATE 60–90 min before imaging. A noncontrast CT was acquired with parameters modulated according to the standard algorithm. The maximum standardized uptake value (SUVmax) was calculated within a volume of interest drawn by visual assessment around suspected lesions on PET. In six patients of meningiomas with NETs, visual analysis of brain lesion was performed based on qualitative uptake of tracer on the68 Ga-DOTATATE scan, the lesions were divided into three grades as follows: Grade I: uptake less than liver but more than background, Grade II: uptake equal to liver, and Grade III: uptake more than liver. The SUVmax of brain lesion/SUVmax of normal brain parenchyma ratio (i.e., tumor/brain tissue ratio) on 68Ga-DOTATATE scan was also calculated as shown in [Figure 2]a and [Figure 2]b. Within 1 week of SSTR imaging,18 F-FDG PET/CT study was undertaken following standard protocol and 6 h fasting on the same PET/CT scanner. 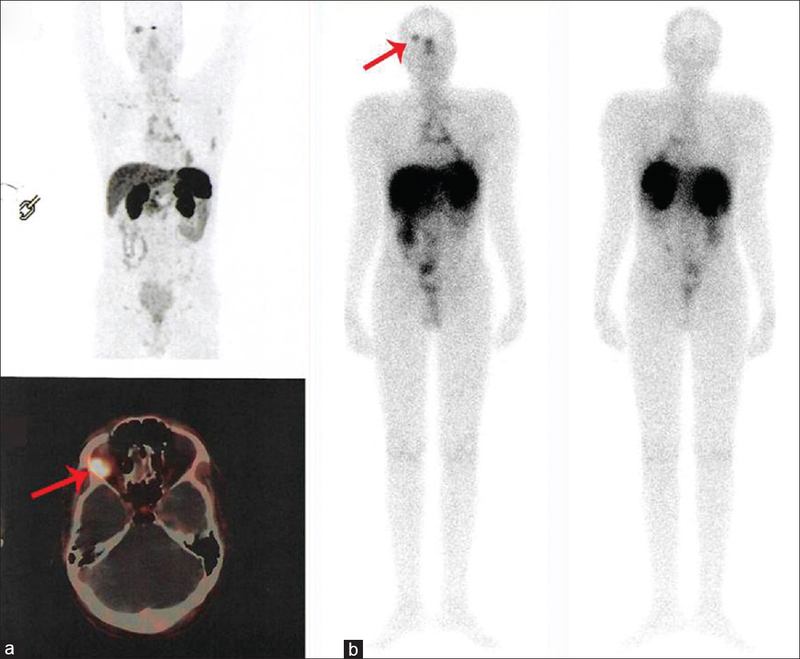 The whole-body18 F-FDG PET/CT scan was acquired after 185–260 MBq of18 F-FDG injection at 60 min. The maximum SUVmax was calculated within a volume of interest drawn by visual assessment around suspected meningiomas on PET/CT. The tumor/brain tissue ratio, i.e., the ratio of SUVmax of brain lesion/SUVmax of normal brain parenchyma on18 F-FDG PET/CT was calculated in all cases. The FDG-PET analyses in these NET patients were evaluated by an experienced nuclear medicine physician who was masked to all other study findings. The magnetic resonance imaging (MRI) of brain examination was ordered after the detection of a suspicious lesion on molecular PET imaging in these NET patients. A comprehensive brain tumor protocol study was undertaken to characterize and establishes a diagnosis in these cases within 1 month of molecular PET imaging. Multiplanar MRI of the brain was performed using spin-echo (SE) T1-weighted (T1W), fast SE T2-weighted, diffusion-weighted, fluid-attenuated inversion recovery, and postcontrast T1W sequences. MR spectroscopy was also performed in the region of interest. The standard parameters such as site, size of the lesion, and signal intensity were noted and tabulated. The imaging appearance of typical meningiomas is well recognized and was considered for deciphering the diagnosis. They are usually homogeneously enhancing dural-based masses with or without a dural tail of enhancement and show similar signal intensity to the adjacent brain on T1-and T2-weighted imaging on MRI as shown in [Figure 2]c and d. Five imaging characteristics that are rarely seen in meningiomas, but common and specific for meningiomas-mimics were also considered during making the diagnosis such as (1) absence of a dural tail of enhancement, other conditions were found; these were (2) homogeneous T2 hypointensity of tumor (3), homogeneous T2 hyperintensity of tumor, (4) osseous destruction adjacent to the mass, and (5) leptomeningeal or pial extension of tumor. The brain MRI images were acquired in a different machine, and these data were transfer to Philips Gemini TF 16 PET/CT system for fusion of PET images with MRI. After fusion of PET and MRI images, these fusion images were viewed in the coronal, sagittal, and axial sections to localize abnormal68 Ga-DOTATATE on PET/CT to a structural lesion on MRI scan. Prerequisites for PRRT treatment were hemoglobin ≥5 mmol/L (≥8 mg/dL), white blood cells ≥3 × 109/L, platelets ≥90 × 109/L, creatinine ≤150 mmol/L (≤1.70 mg/dL), creatinine clearance ≥40 mL/min, and Karnofsky performance status ≥60. For a better evaluation of renal function, glomerular filtration rate (GFR) value and effective renal plasma flow (ERPF) were estimated by renal dynamic scintigraphy before the beginning of PRRT; baseline GFR values in our meningioma patients ranged between 62 and 84 mL/min (mean: 70 mL/min). The therapeutic dose of177 Lu-DOTATATE (150–200 mCi [5.55–7.4 GBq] per cycle, and cycles were repeated at intervals of 12–16 weeks [range, two—six cycles; average, four cycles]) was administered in all using a standardized PRRT protocol with amino acid-based renal protection. The patients were followed up with68 Ga-DOTATATE PET/CT and18 F-FDG PET/CT scan for the posttreatment functional response evaluation, MRI, or CT brain imaging for structural response evaluation and also for symptomatic performance status and symptom logical evaluation after PRRT therapy. The hemoglobin count, complete blood count, and platelet count were obtained after PRRT therapy at regular times to note the bone marrow toxicity and also serum creatinine, GFR, and ERPF also measured to detect renal toxicity after PRRT. 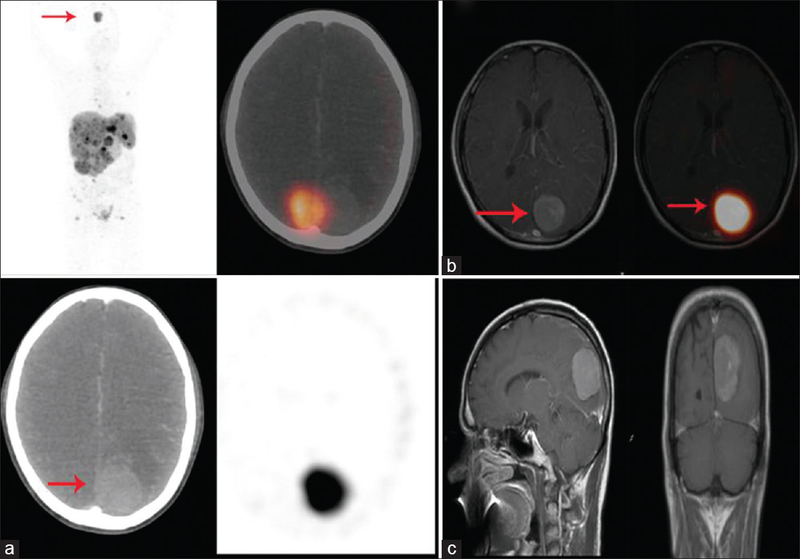 Treatment response in meningiomas after PRRT was assessed under three broad headings as follows: (a) clinical symptomatic response (where patient had baseline symptoms attributable to meningioma), (b) objective response using molecular PET imaging68 Ga-DOTATATE PET/CT, and (c) objective response by anatomical imaging (brain MRI/CT scan). These categories were combined to classify the patients as responders and nonresponders, depending on response criteria as mentioned in [Figure 3] and [Figure 4]. Improvement in neurological symptoms (e.g., seizure, changes in sensation, vision, smell, hearing, personality and memory, headache, and blurring of vision.) related to meningiomas as compared to baseline neurological symptoms before the start of PRRT was documented and defined as a symptomatic response after PRRT. The patients were asked at follow-up with direct questioning on a scale of 0%–100% as to whether neurological symptoms had “disappeared”100% improvement (complete response [CR]) or had “improved” 30%–75% improvement (partial response [PR]) or were “stable” (<30% improvement; stable disease [SD]) or “worse” (>30% increase in symptoms or new neurological symptoms; progressive disease[PD]) compared to baseline and also examined for neurological deficits for symptomatic response evaluation after PRRT. Based on the aforementioned symptomatic response evaluation scale, they were categorized into responders (CR, PR, and SD = response rate) and nonresponders (PD) under symptomatic response assessment. Molecular imaging response evaluation with PET/CT responses were assessed according to the criteria as detailed in the PERCIST (PET Response Criteria in Solid Tumors). Consequently, molecular PET imaging responses were categorized into responders (CR, PR, and SD = response rate) and nonresponders (PD). Response Evaluation Criteria in Solid Tumor 1.1 was used to evaluate anatomical imaging response with brain CT images of PET/CT scan or brain MRI imaging in these NET patients. The anatomical imaging responses were categorized into responders (CR, PR, and SD = response rate) and nonresponders (PD) similar to above response evaluation criteria. The CR, PR, SD, and PD in each of the three response evaluation categories were assessed as aforementioned. Subsequently, the overall “responder” and “nonresponder” (three-scale criteria), in each patient were calculated, if there was documentation of similar response in at least two parameters among the three (i.e., symptomatic, molecular, and anatomical imaging response), as shown in [Figure 4]. The Kaplan–Meier product-limit method was used to calculate the PFS curve; mean and median PFS corresponding 95% confidence intervals (95% CIs) were calculated after the first PRRT cycle for the included cases. The following prognostic variables were documented and analyzed for their association with both PFS and treatment response in meningiomas: histological types and site of NET, WHO grades of NET (Grade 1 Ki-67 index ≤2%, Grade 2 Ki-67 index 3%–20%, and Grade 3 Ki-67 index >20%), surgical resection of NET, previous chemotherapy (cisplatin + etoposide and capecitabine + temozolomide), and octreotide therapy, number of metastatic organ involvement before the start of PRRT (single organ vs. multiple organs involvement), FDG uptake in NET,68 Ga-DOTATATE uptake in NET, number of PRRT cycles and therapeutic dose of177 Lu- DOTATATE administered, and grading of68 Ga-DOTATATE uptake in meningiomas [Table 1]. A total of 500 NET patient's case records were examined, who had undergone177 Lu-DOTATATE therapy between January 2012 and June 2017 at our institute. 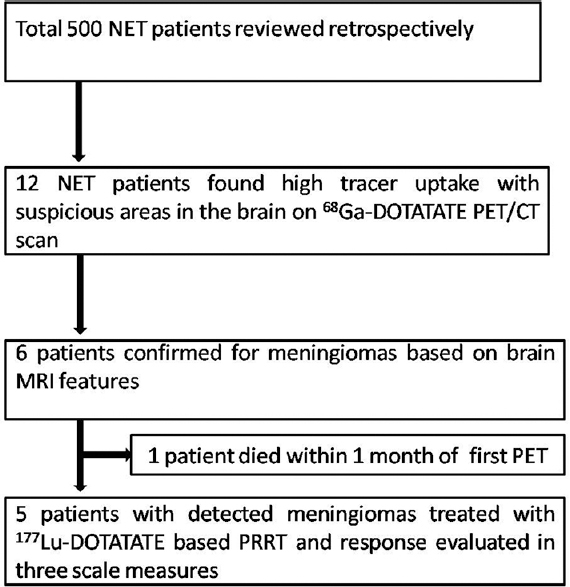 We retrospectively identified 12 NET patients with suspicious uptake in the brain for meningiomas on68 Ga-DOTATATE PET/CT. Of these 12 NET patients, meningioma was diagnosed in six patients based on brain MRI examination, pituitary adenoma was diagnosed in two of 12 patients, and skull base paraganglioma was diagnosed in the remaining four patients. The abnormal tracer uptake in the brain on68 Ga-DOTATATE PET-CT subsequently proven on brain MRI as meningiomas in six of 500 NET patients in our study population, representing a prevalence of 1.2% on the basis of somatostatin scintigraphy (Female = 3, Male = 3, age range: 30–66 years; average age: 45 years). The SUVmax of meningiomas lesion ranged from 7.0 to 22.0 (average 17.0), and the ratio of SUVmax of lesion to SUVmax of normal brain parenchyma ranged from 140 to 400 (average: 340) on68 Ga-DOTATATE PET-CT. On visual analysis, four patients had Grade II and two patients had Grade I uptake on68 Ga-DOTATATE. On18 F-FDG imaging, SUVmax of meningiomas lesion was in the range of 10.19–13.70 (average: 12.10) and the ratio of SUVmax of lesion to SUVmax of normal brain parenchyma was ranging from 1.02 to 1.07 (average: 1.04). The size of meningiomas was ranging from 1.1 to 3.6 cm in the largest diameter (average: 1.7 cm) on MRI brain scan. The baseline neurological symptoms related to meningioma, for example, headache, blurring of vision, diplopia, nausea, and vomiting were present in five of six cases. In most of the cases, the site of meningioma was concordant with patients' neurological symptoms, for example, patient IV had diplopia and blurring of vision due to intraconal, retrobulbar brain lesion abutting optic nerve in the right orbit which was seen in MRI, and detected by68 Ga-DOTATATE PET-CT. Furthermore, most of the patients had headache, which was severe worse in the early morning and the headache was related to the location of brain lesions. Of the six patients, one patient died of the metastatic disease within 1 month after somatostatin scintigraphy and the brain MRI examination. This patient has not included PRRT response evaluation. Five patients received177 Lu-DOTATATE based PRRT with cycles range from two to six (average cycles-4) and177 Lu-DOTATATE therapeutic dose range from 13.28 to 29.97GBq (average dose = 19.86GBq). Follow-up in these patients was in the range of 8–36 months (average 19.4 months) after the first dose of PPRT [Table 2]. All five meningiomas patients had tolerated PRRT procedures well; there was no major hematological and renal toxicity in any of these patients (Grades 2, 3, and 4), except for one patient who showed transient Grade I renal toxicity in the initial PRRT cycles and recovery in subsequent follow-up. Following177 Lu-DOTATATE PRRT therapies, with regard to neurological symptomatic response, CR was observed in two of five meningiomas (40%), PR in one of five meningiomas patients (20%), and PD in two out of five meningiomas (40%). In molecular imaging response evaluation, PR was found in three of five meningiomas (60%), and PD was found two of five meningiomas (40%) on68 Ga-DOTATATE scan after PRRT. In structural imaging response evaluation, SD was found in five patients (100%) after PRRT. The overall “responder” and “nonresponder” (three-scale criteria) in each meningioma patient after PRRT therapy were three patients (60%) and two patients (40%), respectively. Of the five meningiomas patients (PRRT received and response evaluated in these patients), two patients (40%) died at the time of analysis of these data. The observed mean PFS after PRRT in these meningiomas was 26.25 months (95% CI, 16.65–35.84 months) as shown in [Figure 5]. 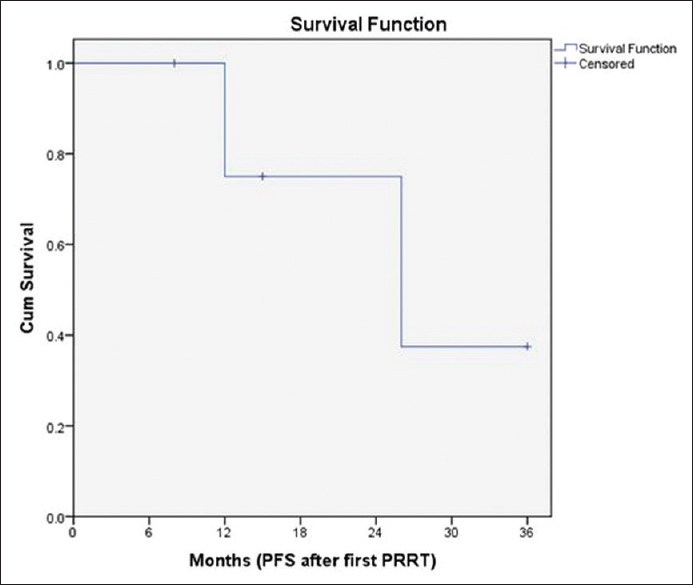 While the associations between PFS and PRRT treatment response to various factors [Table 1] were analyzed, no bio-statistical test was applicable to draw a relationship between PFS and PRRT response with various factors likely due to relatively few patients of meningiomas in this analysis. There is limited data available in the literature about the incidence of meningiomas in NET patients. Kuyumcu et al. studied the incidental detection of meningiomas in a series of 127 patients undergoing68 Ga-DOTATATE scan for NET staging. They identified only one case of meningiomas in their study. Cleary et al. found 21 probable meningioma cases on68 Ga-DOTATATE scan in NET patient population with a prevalence of 6.7% and diagnosis of meningioma was confirmed on MRI/CT scan in 11/313 patients with a prevalence of 3.5% in their study. Vernooij et al. found an incidental meningiomas in 18 patients (0.9%) on unenhanced MRI scans in a 2000-volunteer population aged older than 45 years. In the present study, we observed 12 cases of abnormally increased brain foci on68 Ga-DOTATATE PET/CT scan in metastatic/advanced NET patients being worked up for PRRT. The brain MRI studies showed meningiomas in 6/500 NET patients with a prevalence of 1.2% in our study population. The incidence of six meningiomas in 500 NET patients is higher than the quoted incidence of 7.44/100,000 in the general population, thereby emphasizing the potential role of evaluating the brain with68 Ga-DOTATATE PET/CT in this patient population. The68 Ga-DOTATATE PET/CT has a very high sensitivity to detect meningiomas due to the high density of SSTR expression in the meningiomas resulting in identification and characterization of these lesions as compared to MRI/CT scan [Figure 6] in general population and particularly in NET patients. This leads to high SUVmax value and also a high lesion-to-normal brain parenchyma ratio, as documented in this study. The SUVmax of meningioma lesions ranged from 7.0 to 22.0 (average: 17.0) and also very high ratio which was ranged from 140 to 400 (average: 340) resulting in their high detection rate on68 Ga-DOTATATE PET/CT scan. In this study, all the meningioma lesions were detected on68 Ga-DOTATATE PET/CT scan first due to this high lesion-to-normal brain parenchyma ratio and subsequently they were registered on MRI brain. We also found that18 F-FDG PET/CT imaging was not helpful in identifying meningioma lesions as compared to68 Ga-DOTATATE, as the ratio of SUVmax of meningiomas to normal brain parenchyma on18 F-FDG PET/CT scan was not high ranging from 1.02 to 1.07 (average: 1.04). In this study, none of the meningiomas were detected on18 F-FDG PET/CT [Figures 2]. In most meningioma cases, surgical resection of these lesions is an effective and definitive therapeutic approach. However, meningiomas involving critical structures such as cranial nerves, vascular structures, or the brain stem can render surgery hazardous, with considerable morbidity. In this study, we found one patient had intraconal, retrobulbar lesion, and abutting the right optic nerve, and hence, the surgery was not performed in this patient [Figure 7]. The meningioma patients may be treated with standard external-beam radiotherapy fractionated stereotactic radiotherapy or SRS, and these modalities may show control of tumor growth, especially in small-sized meningiomas, but with high complication rate related to the site and respective treatment modality., In this study, none of the meningioma patients received these types of treatments due to the associated advanced diseases (such as metastatic/advanced NETs in these patients) and also because of complication associated with the various other modalities. Marincek et al. evaluated the role of PRRT in unrespectable progressive meningiomas, they found disease stabilization 68% of cases and worsening of disease was observed in the remaining 32% of meningiomas cases after90 Y-DOTATOC and177 Lu-DOTATOC based PRRT. They also evaluated the efficacy and safety of PRRT in meningiomas cases and found no major hematological and renal toxicities. They suggested that in meningiomas patients with a poor prognosis and having limited therapeutic options, PRRT is an alternative treatment modality that has a reasonable potential for improving the quality and longevity of life with no significant complication associated. Similarly, Bartolomei et al. showed that treatment with90 Y-DOTATOC achieved disease stabilization in 66% of meningiomas patients; PD was observed in the remaining 34%. Gerster-Gilliéron et al. prospectively studied the feasibility, toxicity, and efficacy of90 Y-DOTATOC based PRRT in complex meningiomas cases, and found overall median PFS was at least 24 months after PRRT with transient hematological toxicities in these cases. To the best of our knowledge, no study has evaluated the role of PRRT in meningiomas detected in patients harboring metastatic/advanced NETs, and this is because of the very low prevalence of such cases. In our retrospective evaluation study, we evaluated the efficacy of177 Lu-DOTATATE PRRT in this challenging group of patients with dual tumors and studied the performance of PRRT relating to symptomatic, molecular and structural response, and PFS (of the meningioma lesions) and any toxicity related to the administered therapy. We found that the overall percentage of “responder” was in 60% [case example illustrated in [Figure 2] and [Figure 7] and “nonresponder” in remaining 40% of these cases following177 Lu-DOTATATE based PRRT. The results were similar to PRRT therapy used for progressive, Unresectable, and complex meningiomas in patients without NET tumors. In this particular study population, the patients harbored meningiomas in conjunction to metastatic/advanced NETs, resulting in significant morbidity in these cases, therefore, other treatment options such as surgical resection, external-beam radiotherapy could result in an additional complication, and significant morbidity. One limitation of this study is lack of obtaining histological confirmation of meningiomas (primarily deciphered from correlative brain MRI features in addition to68 Ga-DOTATATE PET-CT in the analyzed cases), which was not feasible due to obvious ethical and practical feasibility reasons. In this study, we observed mean PFS in the meningiomas was 26.25 months (95% CI, 16.65–35.84 months), which would indicate that177 Lu-DOTATATE based PRRT has the potential to stabilize and control the disease in addition to excellent symptomatic response and improving the quality of life. The therapies were well tolerated in this group of patients without any major hematological and renal toxicity. As well as general conditions of the NET patients with extensive disease. However, MRI is highly accurate in the diagnosis of meningiomas with specific features related to meningiomas are seen on MRI such as homogeneously enhancing dural-based masses with or without a dural tail of enhancement and similar signal intensity to the adjacent brain on T1- and T2-weighted imaging on MRI. In this study, every positive case had shown abnormal tracer uptake in the brain region on68 Ga-DOTATATE PET/CT that was followed brain MRI examination and we critically examined the MRI features as aforementioned for the diagnosis of meningiomas with high accuracy and differentiating them from brain metastatic disease in these cases. The peer-reviewed literature suggests the rare possibility of meningiomas associated with NET tumors; this result in significant comorbidity, and difficulty in treatment and deterioration in the quality of life in these cases. The68 Ga-DOTATATE PET/CT study is an effective imaging technique for the identification of meningiomas due to high expression of SSTR in lesions resulting in high SUVmax with excellent lesion to background (normal brain parenchyma) ratio. In incidentally detected meningiomas associated with NETs with limited therapeutic options, the PRRT could be considered as a “single-shot” treatment modality targeting both tumors. The PRRT can improve the neurological symptoms, quality of life, and also stabilize disease process without any significant toxicity in these groups of patients with meningioma associated with metastatic/advanced NETs. This was a retrospective analysis; hence, the requirement of informed consent was waived. Mawrin C, Perry A. Pathological classification and molecular genetics of meningiomas. J Neurooncol 2010;99:379-91. Wiemels J, Wrensch M, Claus EB. Epidemiology and etiology of meningioma. J Neurooncol 2010;99:307-14. Saraf S, McCarthy BJ, Villano JL. Update on meningiomas. Oncologist 2011;16:1604-13. Zentner J, Meyer B, Vieweg U, Herberhold C, Schramm J. Petroclival meningiomas: Is radical resection always the best option? J Neurol Neurosurg Psychiatry 1997;62:341-5. O'Sullivan MG, van Loveren HR, Tew JM Jr. The surgical resectability of meningiomas of the cavernous sinus. Neurosurgery 1997;40:238-44. Mirimanoff RO, Dosoretz DE, Linggood RM, Ojemann RG, Martuza RL. Meningioma: Analysis of recurrence and progression following neurosurgical resection. J Neurosurg 1985;62:18-24. Jääskeläinen J, Haltia M, Servo A. Atypical and anaplastic meningiomas: Radiology, surgery, radiotherapy, and outcome. Surg Neurol 1986;25:233-42. Minutoli F, Amato E, Sindoni A, Cardile D, Conti A, Herberg A, et al. Peptide receptor radionuclide therapy in patients with inoperable meningiomas: Our experience and review of the literature. Cancer Biother Radiopharm 2014;29:193-9. Thapa P, Parghane R, Basu S.177 Lu-DOTATATE peptide receptor radionuclide therapy in metastatic or advanced and inoperable primary neuroendocrine tumors of rare sites. World J Nucl Med 2017;16:223-8. Yao JC, Hassan M, Phan A, Dagohoy C, Leary C, Mares JE, et al. One hundred years after “carcinoid”: Epidemiology of and prognostic factors for neuroendocrine tumors in 35,825 cases in the United States. J Clin Oncol 2008;26:3063-72. Bombardieri E, Maccauro M, De Deckere E, Savelli G, Chiti A. Nuclear medicine imaging of neuroendocrine tumours. Ann Oncol 2001;12 Suppl 2:S51-61. Olsen JO, Pozderac RV, Hinkle G, Hill T, O'Dorisio TM, Schirmer WJ, et al. Somatostatin receptor imaging of neuroendocrine tumors with indium-111 pentetreotide (Octreoscan). Semin Nucl Med 1995;25:251-61. Briganti V, Sestini R, Orlando C, Bernini G, La Cava G, Tamburini A, et al. Imaging of somatostatin receptors by indium-111-pentetreotide correlates with quantitative determination of somatostatin receptor type 2 gene expression in neuroblastoma tumors. Clin Cancer Res 1997;3:2385-91. Chiti A, Briganti V, Fanti S, Monetti N, Masi R, Bombardieri E, et al. Results and potential of somatostatin receptor imaging in gastroenteropancreatic tract tumours. Q J Nucl Med 2000;44:42-9. Chiti A, Fanti S, Savelli G, Romeo A, Bellanova B, Rodari M, et al. Comparison of somatostatin receptor imaging, computed tomography and ultrasound in the clinical management of neuroendocrine gastroenteropancreatic tumours. Eur J Nucl Med 1998;25:1396-403. Krenning EP, Kwekkeboom DJ, Bakker WH, Breeman WA, Kooij PP, Oei HY, et al. Somatostatin receptor scintigraphy with [111In-DTPA-D-phe1]- and [123I-tyr3]-octreotide: The Rotterdam experience with more than 1000 patients. Eur J Nucl Med 1993;20:716-31. Seregni E, Chiti A, Bombardieri E. Radionuclide imaging of neuroendocrine tumours: Biological basis and diagnostic results. Eur J Nucl Med 1998;25:639-58. Jamar F, Fiasse R, Leners N, Pauwels S. Somatostatin receptor imaging with indium-111-pentetreotide in gastroenteropancreatic neuroendocrine tumors: Safety, efficacy and impact on patient management. J Nucl Med 1995;36:542-9. Lebtahi R, Cadiot G, Sarda L, Daou D, Faraggi M, Petegnief Y, et al. Clinical impact of somatostatin receptor scintigraphy in the management of patients with neuroendocrine gastroenteropancreatic tumors. J Nucl Med 1997;38:853-8. Kowalski J, Henze M, Schuhmacher J, Mäcke HR, Hofmann M, Haberkorn U, et al. Evaluation of positron emission tomography imaging using [68Ga]-DOTA-D phe(1)-tyr(3)-Octreotide in comparison to [111In]-DTPAOC SPECT. First results in patients with neuroendocrine tumors. Mol Imaging Biol 2003;5:42-8. Kwekkeboom DJ, de Herder WW, van Eijck CH, Kam BL, van Essen M, Teunissen JJ, et al. Peptide receptor radionuclide therapy in patients with gastroenteropancreatic neuroendocrine tumors. Semin Nucl Med 2010;40:78-88. Strosberg J, El-Haddad G, Wolin E, Hendifar A, Yao J, Chasen B, et al. Phase 3 trial of177 Lu-dotatate for midgut neuroendocrine tumors. N Engl J Med 2017;376:125-35. Dutour A, Kumar U, Panetta R, Ouafik L, Fina F, Sasi R, et al. Expression of somatostatin receptor subtypes in human brain tumors. Int J Cancer 1998;76:620-7. Schulz S, Pauli SU, Schulz S, Händel M, Dietzmann K, Firsching R, et al. Immunohistochemical determination of five somatostatin receptors in meningioma reveals frequent overexpression of somatostatin receptor subtype sst2A. Clin Cancer Res 2000;6:1865-74. Arena S, Barbieri F, Thellung S, Pirani P, Corsaro A, Villa V, et al. Expression of somatostatin receptor mRNA in human meningiomas and their implication inin vitro antiproliferative activity. J Neurooncol 2004;66:155-66. Cleary JO, Yeung J, McMeekin H, Wilhelm T, Wagner T. The significance of incidental brain uptake on 68Ga-DOTATATE PET-CT in neuroendocrine tumour patients. Nucl Med Commun 2016;37:1197-205. Starr CJ, Cha S. Meningioma mimics: Five key imaging features to differentiate them from meningiomas. Clin Radiol 2017;72:722-8. Wahl RL, Jacene H, Kasamon Y, Lodge MA. From RECIST to PERCIST: Evolving considerations for PET response criteria in solid tumors. J Nucl Med 2009;50 Suppl 1:122S-50S. Parghane RV, Talole S, Prabhash K, Basu S. Clinical response profile of metastatic/Advanced pulmonary neuroendocrine tumors to peptide receptor radionuclide therapy with 177Lu-DOTATATE. Clin Nucl Med 2017;42:428-35. Sindoni A. Somatostatin receptor-targeted radiopeptide therapy in patients with progressive unresectable meningioma. J Nucl Med 2016;57:1657. Brem SS, Bierman PJ, Brem H, Butowski N, Chamberlain MC, Chiocca EA, et al. Central nervous system cancers. J Natl Compr Canc Netw 2011;9:352-400. Kuyumcu S, Özkan ZG, Sanli Y, Yilmaz E, Mudun A, Adalet I, et al. Physiological and tumoral uptake of (68)Ga-DOTATATE: Standardized uptake values and challenges in interpretation. Ann Nucl Med 2013;27:538-45. Mathiesen T, Kihlström L, Karlsson B, Lindquist C. Potential complications following radiotherapy for meningiomas. Surg Neurol 2003;60:193-8. Nishio S, Morioka T, Inamura T, Takeshita I, Fukui M, Sasaki M, et al. Radiation-induced brain tumours: Potential late complications of radiation therapy for brain tumours. Acta Neurochir (Wien) 1998;140:763-70. Marincek N, Radojewski P, Dumont RA, Brunner P, Müller-Brand J, Maecke HR, et al. Somatostatin receptor-targeted radiopeptide therapy with 90Y-DOTATOC and 177Lu-DOTATOC in progressive meningioma: Long-term results of a phase II clinical trial. J Nucl Med 2015;56:171-6. Bartolomei M, Bodei L, De Cicco C, Grana CM, Cremonesi M, Botteri E, et al. Peptide receptor radionuclide therapy with (90)Y-DOTATOC in recurrent meningioma. Eur J Nucl Med Mol Imaging 2009;36:1407-16. Gerster-Gilliéron K, Forrer F, Maecke H, Mueller-Brand J, Merlo A, Cordier D, et al. 90Y-DOTATOC as a therapeutic option for complex recurrent or progressive meningiomas. J Nucl Med 2015;56:1748-51.